Mohau Modisakeng was born in Soweto in 1986 and lives and works between Johannesburg and Cape Town. He completed his undergraduate degree at the Michaelis School of Fine Art, Cape Town in 2009 and worked towards his Masters degree at the same institution. 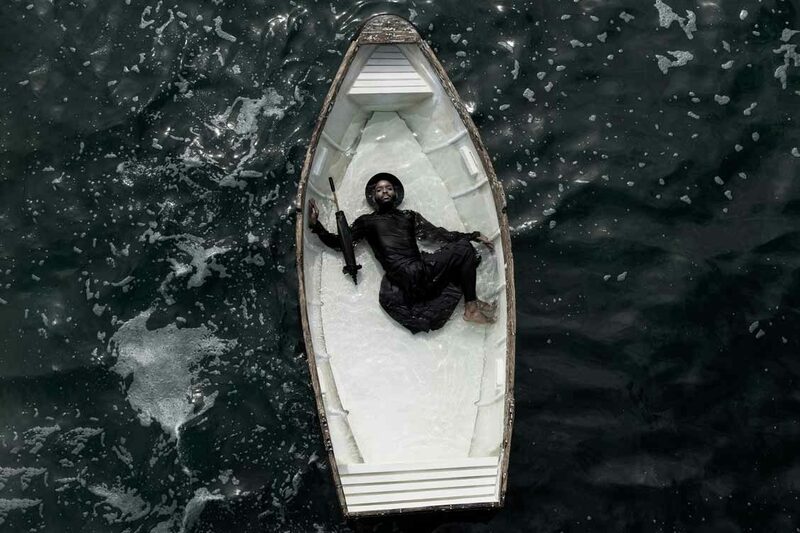 Modisakeng recently performed at the Sharjah Biennale 14: Leaving the Echo Chamber in 2019. His work has also been exhibited at the Zeitz Museum of Contemporary Art Africa, Cape Town (2017); PERFORMA17, New York (2017); Tyburn Gallery, London (2016); IZIKO South African National Gallery, Cape Town (2014); Saatchi Gallery, London (2012); and the Dak’Art Biennale, Dakar (2012). Public Collections include the Johannesburg Art Gallery, IZIKO South African National Gallery, Saatchi Gallery, the From Cobra to Contemporary Collection, EKARD Collection, Dommering collection, and Zeitz MOCAA. Modisakeng has been awarded the Standard Bank Young Artist Award for Visual Art in 2016. As part of a two-person exhibition, Modisakeng also represented South Africa at the 57th Venice Biennale last year (2017).